Club Sound is opened more than 15 years ago and represents pioneer between clubs with similar type of music. Very soon after the opening club Sound became a favorite place for urban Belgrade clubbers who knew how to recognize and see the quality that club Sound has to offer, for more than a decade. 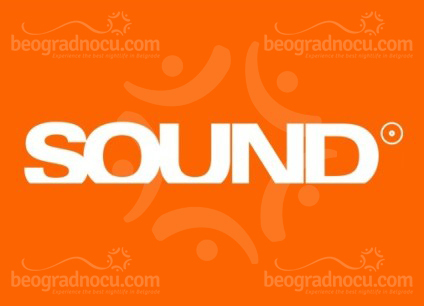 Club Sound is located in the most popular place for summer fun in Belgrade, on Sava quay in Brodarska bb Street, between Old Railway bridge and bridge Gazela. Recently club Sound has been trough big esthetic changes and you can tell for certain that now it presents the final top of the nightlife in Belgrade. In club Sound you can find fantastic electro sound, mostly non commercial house and dance music, that makes every party unique, better and different. If you are looking for a place to complete all of your expectations, and you are a fan of top notch cocktails, real clubbing atmosphere and you want to hear the best domestic and foreign DJ’s, than the club Sound is the right place for you. One of the rare places in Belgrade that is also known as “club on water” with its genuine meaning, and it is a place exclusively for DJ scene. You say that club Sound is a mix of urban and original in great ways, which makes this club one of the most visited places in Belgrade. Club Sound mostly hosts a bit elder crew, but also everyone who know to appreciate great house sound.